Ross Video (Booth SL1805) is introducing the latest addition to its suite of camera motion systems. The Furio SkyDolly is a ceiling-mounted version of the industry-leading Furio family of camera robotics and offers the features of Furio while also addressing challenges specific to ceiling-mounted dolly systems. Furio SkyDolly is designed for safety and stability for overhead moving shots. Furio SkyDolly has been designed with safety as a priority: the fully captive dolly cannot be derailed and comes with safety tethers for the payload and head. Its sturdy three-wheel design, enlarged wheelbase (60% wider and 40% longer than other Furio solutions), and raised center of mass ensure shake-free operation, even at high speeds, providing stability for dramatic overhead moving shots. Custom cable management reduces drag and moves quietly, with minimal impact on overall footprint. SkyDolly also features a payload capacity high enough to support a full-size prompter, ensuring that SkyDolly can be used for much more than just beauty shots. Initially available with fixed columns ranging 12 in. 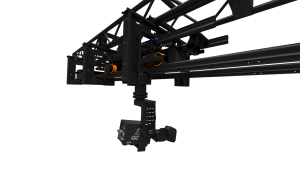 to 48 in., Furio SkyDolly is fully compatible with all Furio heads and can easily be added to existing Ross Robotics solutions under SmartShell or OverDrive control. Like all Furio systems, it also provides accurate tracking data for virtual-studio/augmented-reality applications. An inverted lift mechanism will be made available later this year.